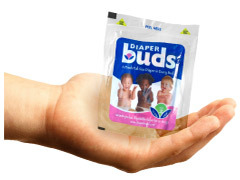 Pack of individually wrapped nappy buds, great for grab and go! Vacuum sealed so they take up less space in your luggage. Blooms into a full size disposable nappy. 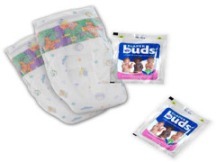 DiaperBuds are vacuum-packed disposable nappies designed to take up less space in a nappy bag or suitcase. Absorbency and fit are not compromised in favor of compactness. The vacuum-sealed packaging also offers a hygienic seal, so your nappies are protected from spills and dirt. Dermatologist tested for sensitive skin.